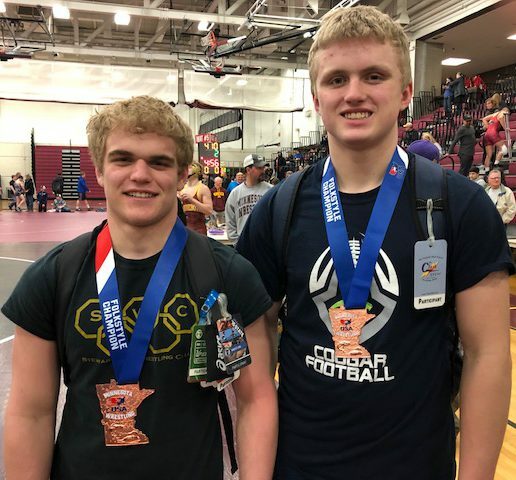 Tyler Soltau and Jack Haglund competed at the MN/USA Cadet & Junior State Folkstyle Tournament in Anoka. Tyler placed 3rd at 170# as a Junior and Jack 6th at HWT as a Cadet. Jack was the only 220# entered, so he opted up to HWT and wrestled 4 matches. Good job by both! Monday– Youth open mat/team practice and JH/High School open mat 6 PM. Freestyle/Greco RTS at RCTC wrestling room, 7 PM. Tuesday & Thursday– Youth open mat/team practice and JH/High School open mat 6 PM. Freestyle/Greco via Guerilla Wrestling Club at RCTC wrestling room, 7 PM. $50 for the season. Friday– NYWA Region Qualifier in Byron for 5th-8th grade. Saturday– NYWA Region Qualifier in Byron for PreK-4th grade. Sunday– NYWA Team Region Qualifier in Eyota. Wrestling starts at 9 AM.